Kira Lynn Harris, La Cienega Boulevard around Cadillac Avenue, Los Angeles, February-March 2010. Part of "How Many Billboards? Art in Stead" temporary project organized by the MAK Center for Art and Architecture. "Her choice of subject reflects Harris's love of the towers themselves, her interest in artworks that do not easily reside in one discipline or another, and her concern with the marginalization of community-based art projects from the mainstream art world. The words "Community as Art" in boldface suggest that community building and place-making can be viable art-making practices. The third element, ghostly variations of phrases that contain the words "community" and "art," give the sense that there are many possibilities for these ideas to come together." 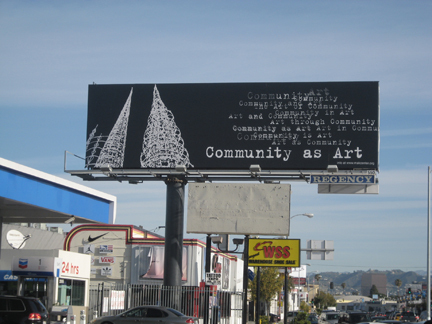 - text from a longer description by Kimberli Meyer, http://www.howmanybillboards.org/, accessed 03/2010.